Congratulations to Florence and Tabitha Lunn, for their selection to represent England in the World Schools Championships which takes place in April 2019 in Otepaa, Estonia. Both girls will be members of the Junior Girls team and Oliver Flippance will be a reserve in the Senior Boys team. These selections were made following successful performances at the British Schools Championships and selection races in Blackburn earlier this month. The Kenilworth School pupils have achieved some great results throughout the year at major national and regional events around the UK. Their commitment to travel and train with the West Midlands Junior Squad has helped secure their places in the England team. Club members Mel Elkington, deputy head of delegation, coaches Sophie Kirk and Jane Halliday (ex OD) will join England team officials in Estonia. This weekend selected junior club members of the West Midland Squads will be training with other eight regional squads in the Lake District at Graythwaite and Holme Fell. Next event: The next race takes place at Itchington Holt, Harbury, on Sunday, December 9 with starts anytime from 10.30 until 12 noon. No need to pre-book, just turn up and enjoy this fun outdoor active sport. There will be several courses, from 2km up to 6km, to suit all ages, 5 – 85 years, from beginners to experienced orienteers, especially families. 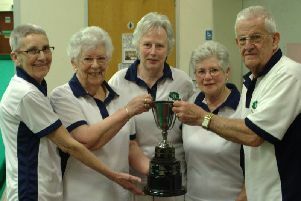 The event is a West Midlands League event and is also the Club Championship. Competitors will be looking for control points around the parkland and wooded areas, using a specially drawn map – a bit like a treasure hunt. Help is given to all newcomers, bring a compass if you have one. Full details are on www.octavian-droobers.org website, contact event organiser for more information, or call (01926) 632189.